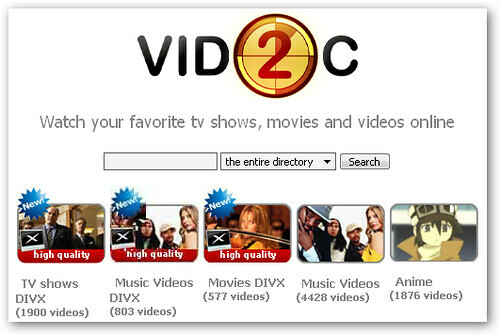 Vid2C joins the ranks of AllofTV, Alluc, and PeekVid in offering TV shows, movies, and other video content for convenient online viewing. The name seems to translate to "video to computer". How you navigate the site isn't too blindingly obscure either. Videos are categorized into 10 sections, including TV shows, cartoons, movies, and celebs. Video connoisseurs will be pleased to find the high-quality videos separated from the regular masses into their own section. At a rough count, there looks to be about 30,000 videos linked from Vid2C so you shouldn't have any problem finding original content to watch. The latest movies including The Bourne Ultimatum and Rush Hour 3 can be found on the site. It's worth noting that like all of its sister sites, none of the copyrighted videos are actually hosted directly on the site. Only links to videos stored on third-party sites are posted.